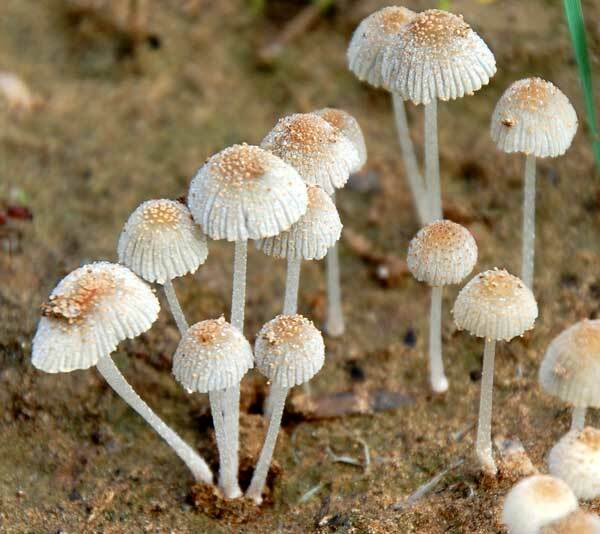 Arizona Naturalists >>> Sonoran Desert Naturalist >>> Field Guide >>> Fungi >>> Mycenaceae >>> Mycena sp. A few days after a sandy bank near Mesquite Wash was flooded these small mushrooms emerged for sporulation (Maricopa Co., Arizona in Aug. 2009). There are hundreds of Mycena mushroom species. Most are saprophytic, with subterranean hyphae feeding on buried, decaying vegetation. The mushroom, or fruiting body, appears above ground only briefly when temperature and humidity are ideal for spreading spores into the environment and thus reproducing a new generation. Mycena are very small; in this case the caps are less than 12 mm wide. The cap is conical, the stem very slender, and the spores are white. Some Mycena are apparently edible and others toxic. And because these mushrooms are so small, collectors generally ignore them.